Marie joined PrimeCare in 2018. Marie brings a diverse medical background to PrimeCare, having experience in Laboratory Science, Immunology, Emergency Medicine and Internal Medicine. She obtained a B.S. in Medical Technology from George Mason University and worked behind the scenes at the University of Virginia Clinical Labs until 2012. Marie graduated from James Madison University with a Masters Degree in Physician Assistant Studies in 2014. Marie’s background in primary care and the emergency medicine brings a strong knowledge and skill base to our PrimeCare team. 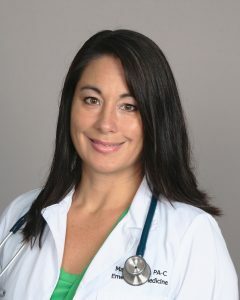 Marie is a Fellow of the Virginia Academy of Physician Assistants. She currently resides in the Fredericksburg area with her husband and two children. Marie enjoys playing tennis and golf, running, and spending time with her family.